Ban Mae Ma The village has scenic views in the middle of the valley, with waterfalls and streams flowing through the village. Most of the revenue comes from the collection of wreaths. And weave a basket of vegetables. Villagers will pursue a career alongside natural healing. 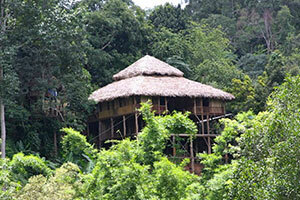 It has developed a village to the natural tourist attraction. View community life See how to make a herbal, hiking, which is the main occupation of the villagers. And if tourists want to relax. There will be people in the service of traditional massage. Baking with herbs, the way of life of the people is called 'living in contentment. Travel Mae Ma Village Away from the city of Chiang Mai, 60 kilometers, turn left at Ban Huai Joo, turn left onto the reinforced concrete road about 6 kilometers.